Born on June 1, 1919 in Schwerin, Heinz-Georg Lemm was one of the most highly decorated soldiers in World War II Germany, winning the Knight’s Cross with Oak Leaves and Swords. His early career saw him assigned to the 12th Infantry Division, serving many positions in the 27th Infantry Regiment in Poland, France and Russia (including the encirclement at the Demjansk Pocket.) In addition to these awards, Lemm won the Tank Destruction Badge, Close Combat Badge in Silver, Wound Badge in Silver and the German Cross in Gold. He ended the war as an oberst (the youngest in the German Army) and the commander of the 27th Fusilier Regiment, having fought with the unit against American forces in the Battle of the Bulge. 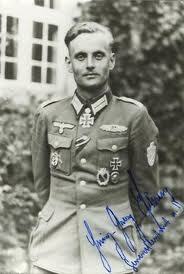 In a discussion with Major MacLean in 1991, Heinz Georg-Lemm stated that he was at Hitler’s headquarters at Rastenburg on July 20 to receive the Oak Leaves to his Knight’s Cross. As the day was hot, the officers’ mess was moved from inside a building to outside under several trees. Major Lemm sat down at a table and shortly after, another officer sat down beside him. It would turn out to be Oberst Claus von Stauffenberg, who engaged in small talk before leaving, telling Major Lemm that he had to get ready to brief Hitler. The bomb in von Stauffenberg’s brief case later exploded near Hitler in the briefing room, and Lemm’s award ceremony was postponed until the following day. But someone remembered that von Stauffenberg had conversed with Lemm and for several hours, interrogators asked Major Lemm what the two had discussed, before finally clearing him of any potential complicity in the assassination attempt. Heinz-Georg Lemm was a prisoner of American forces for ten months, until 1946. He was then transferred to Soviet control and confined to a Soviet prisoner of war camp until 1950, when he returned to Germany. In 1957, Heinz-Georg Lemm joined the post-war German Bundeswehr (Post-WWII German Army) and progressed to the rank of lieutenant general. He commanded the 5th Panzer Division and the Troop Office of the Bundeswehr before retiring on September 30, 1979. He then led the Association for Knight’s Cross Recipients. General Lemm retired to the small village of Ruppichteroth, northeast of Bonn, to be closer to his old Army friend and fellow Knight’s Cross winner, Martin Steglich. Heinz-Georg Lemm died on November 17, 1994.